French President denounces anti-Semitism, calls for toughness in fighting it. 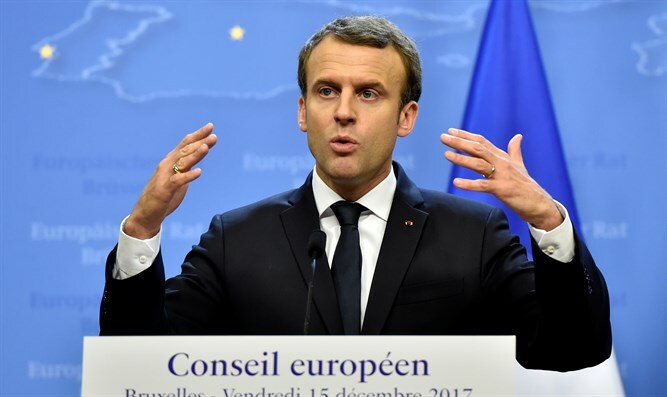 French President Emmanuel Macron on Wednesday denounced anti-Semitism and said that his country would not be the same without Jews. "There is an old French anti-Semitism. We have to recognize it and to protect our Jewish people. French Republic would not be the same without the Jewish people. They belong to the Republic," he tweeted. Macron, who is visiting Washington, also denounced anti-Semitism in a speech at George Washington University. "Anti-Semitism is incompatible with the French Republic," he told the students, adding that "we have to be very tough" in the fight against the phenomenon. Anti-Semitism has been on the rise in France in recent years and have included violent attacks and murders. Last month, 85-year-old French Holocaust survivor Mireille Knoll was murdered in her apartment in Paris. Prosecutors have indicted two defendants in connection with what is being tried as a murder with aggravated circumstances of a hate crime. They are also charged with robbery. In addition to anti-Semitic violence, there have been several other incidents of incidents targets Jews in Paris in recent weeks. Macron, who denounced Knoll's murder as "appalling", also attended her funeral and said, "This is a crime and a murder of a helpless woman only because of one fact: that she was Jewish."